Céline Marie Claudette Dion CC OQ ChLD (/ˈdiːɒn/; French: ; born 30 March 1968) is a Canadian singer. Born into a large family from Charlemagne, Quebec, she emerged as a teen star in her homeland with a series of French-language albums during the 1980s. She first gained international recognition by winning both the 1982 Yamaha World Popular Song Festival and the 1988 Eurovision Song Contest where she represented Switzerland. After learning to speak English, she signed on to Epic Records in the United States. In 1990, Dion released her debut English-language album, Unison, establishing herself as a viable pop artist in North America and other English-speaking areas of the world. 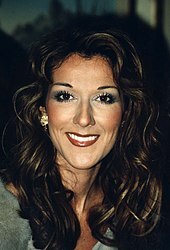 Céline Marie Claudette Dion CC OQ ChLD (/ˈdiːɒn/; French: [selin djɔ̃]; born 30 March 1968) is a Canadian singer. Born into a large family from Charlemagne, Quebec, she emerged as a teen star in her homeland with a series of French-language albums during the 1980s. She first gained international recognition by winning both the 1982 Yamaha World Popular Song Festival and the 1988 Eurovision Song Contest where she represented Switzerland. After learning to speak English, she signed on to Epic Records in the United States. In 1990, Dion released her debut English-language album, Unison, establishing herself as a viable pop artist in North America and other English-speaking areas of the world. During the 1990s, she achieved worldwide fame after releasing several best-selling English albums such as Falling into You (1996) and Let's Talk About Love (1997), both of which were both certified diamond in the US. She also scored a series of international number-one hits, including "The Power of Love", "Think Twice", "Because You Loved Me", "It's All Coming Back to Me Now", "My Heart Will Go On", and "I'm Your Angel". Dion continued releasing French albums between each English record; D'eux (1995) became the best-selling French-language album of all time, while S'il suffisait d'aimer (1998), Sans attendre (2012), and Encore un soir (2016) were all certified diamond in France. During the 2000s, she built her reputation as a highly successful live performer with A New Day... in Las Vegas Strip (2003–07), which remains the highest-grossing concert residency of all time, as well as the Taking Chances World Tour (2008–09), one of the highest-grossing concert tours of all time. Dion's music has been influenced by genres ranging from rock and R&B to gospel and classical. Her recordings are mainly in French and English, although she also sings in Spanish, Italian, German, Latin, Japanese, and Mandarin Chinese. While her releases have often received mixed critical reception, she is regarded as one of pop music's most influential voices. She has won five Grammy Awards, including Album of the Year and Record of the Year. Billboard named her the "Queen of Adult Contemporary" for having the most number ones on the radio format for a female artist. She is the second best-selling female artist in the US during the Nielsen SoundScan era. In 2003, she was honoured by the International Federation of the Phonographic Industry (IFPI) for selling over 50 million albums in Europe. She remains the best-selling Canadian artist and one of the best-selling artists of all time with record sales of over 200 million copies worldwide. Dion was born in Charlemagne, Quebec, 15 miles northeast of Montreal, the youngest of 14 children of Thérèse (née Tanguay), a homemaker, and Adhémar Dion, a butcher, both of French-Canadian descent. She was raised a Roman Catholic in a poor, but, by her own account, happy home in Charlemagne. Music had always been a major part of the Dion family, and she was named after the song "Céline", which French singer Hugues Aufray had recorded two years before her own birth. On 13 August 1973, at the age of five, the young Céline made her first public appearance at her brother Michel's wedding, where she performed Christine Charbonneau's song "Du fil des aiguilles et du coton". She continued to perform with her siblings in her parents' small piano bar called Le Vieux Baril, "The Old Barrel". From an early age, she had dreamed of being a performer. In a 1994 interview with People magazine, she recalled, "I missed my family and my home, but I don't regret having lost my adolescence. I had one dream: I wanted to be a singer." Many artists have either mentioned Dion as a major influence or as one of their favourite singers including: Britney Spears, Rihanna, Christina Aguilera, Frank Ocean, Adele, Josh Groban, Delta Goodrem, Jordin Sparks, Charice, Leona Lewis, Jessie J, Jojo, Lea Michele,[better source needed] Jennifer Hudson, Ariana Grande, Regine Velasquez, Taylor Swift, Vanessa Hudgens, The Canadian Tenors, Faith Hill, Katy Perry, Sevyn Streeter and Kelly Clarkson, among many others. Country singer Martina McBride is widely heralded by the press as the Celine Dion of Country music. ↑ Lynch, Joe (2 December 2014). "Celebritynetworth/Celine dion". Retrieved 3 December 2014. ↑ Billboard Staff (1 May 2017). "Being Celine: A Look Back at the Illustrious Career of Celine Dion". Billboard. Retrieved 26 November 2018. ↑ Conor, Gaffey (28 July 2016). "Celine Dion Salutes Her Gabonese Imitator". Newsweek. Retrieved 21 February 2017. ↑ Ptashnick, Victoria (22 August 2013). "Céline Dion joins Twitter". Toronto Star. Retrieved 2 February 2014. 1 2 "The 'ultimate diva'". People in the News. CNN. 22 October 2002. Retrieved 25 September 2013. 1 2 3 4 "Profiles of Celine Dion, Enrique Iglesias, Moby". Paula Zahn, Charles Molineaux, Gail O'Neill. People in the News, 18 May 2002. Transcript. ↑ Germain, Georges-Herbert (1998). Céline: The Authorized Biography. translated by David Homel and Fred Reed. Dundurn Press. p. 16. ISBN 978-1-55002-318-3. 1 2 3 4 "Dion, Celine". Jam!. Canoe.ca. Retrieved 25 September 2013. ↑ Celine Dion Biography Archived 27 September 2013 at the Wayback Machine, The Biography Channel. 13 September 2007. ↑ O'Connor, John Kennedy (2 April 2007). The Eurovision Song Contest — The Official History. UK: Carlton Books. ISBN 978-1-84442-994-3. ↑ "Céline Dion". MTV Artists. Retrieved 27 September 2014. 1 2 3 4 "Celine Dion". The Canadian Encyclopedia. Historica-Dominion. Archived from the original on 27 September 2013. Retrieved 25 September 2013. 1 2 3 Bombardier, Denise (2009). L'énigmatique Céline Dion (in French). Albin Michel, XO éditions. pp. 172–73. ISBN 978-2-84563-413-8. 1 2 Germain, Georges-Hébert (2010). René Angélil: Derrière le conte de fées, Michel Lafon. pp. 279–280. ↑ Farber, Jim (25 January 1991). "Review—Céline Dion Unison". Entertainment Weekly. Archived from the original on 25 June 2009. Retrieved 10 February 2012. ↑ "Allmusic". Review—Céline Dion Unison. Retrieved 18 November 2005. ↑ Bliss, Karen (1 March 2004). "25 Years of Canadian Artists". Canadian Musician. p. 34. ISSN 0708-9635. 1 2 3 Alexander, Charles P. "The Arts & Media/Music: At Age Five She Belted Out French pop tunes standing atop tables". Time International. 28 February 1994. pg 44. 1 2 3 4 5 6 7 "Celine Dion". Newsmakers 1995, Issue 4. Gale Research, 1995. ↑ "Celine Dion". Biography. Retrieved 26 April 2006. 1 2 3 "Celine Dion". Contemporary Musicians, Volume 25. Gale Group, 1999. 1 2 "Celine Dion The Colour of My Love". Plugged In. Archived from the original on 2 April 2012. Retrieved 27 September 2013. ↑ "The Journey so Far". Celinedion.com. Archived from the original on 9 July 2012. Retrieved 16 August 2005. 1 2 "Celine Dion". Compton's by Britannica. Encyclopædia Britannica. 2005. ↑ Celine Dion Archived 11 January 2012 at the Wayback Machine; retrieved 12 October 2009. ↑ "Les disques d'or" (in French). Archived from the original on 11 October 2012. Retrieved 27 September 2013. ↑ Erlewine, Stephen Thomas. Let's Talk About Love: Album review. Allmusic; retrieved 12 October 2009. ↑ https://www.allmusic.com/album/r232836 AllMusic.com; retrieved 12 October 2009. 1 2 Jerome, Jim. "The Dream That Drives Her. (Singer Celine Dion) (Interview)", Ladies Home Journal, 1 November 1997. 146(4). 1 2 "Entertainment Weekly". Review --Falling into You. Archived from the original on 5 January 2009. Retrieved 14 July 2006. ↑ Leroy, Dan (12 March 1996). "Album Review: Falling into You". Yahoo Music. Archived from the original on 8 July 2012. Retrieved 1 February 2012. ↑ Stephen, Holden. Review: Falling into you. The New York Times. (Late Edition (East Coast)). New York: 14 April 1996. ↑ "Allmusic". Review --Falling into You. Retrieved 1 November 2005. ↑ "Angelfire.com". Céline Dion Discography. Retrieved 1 November 2005. ↑ "CBC Music". Music.cbc.ca. Archived from the original on 1 March 2016. Retrieved 27 September 2014. 1 2 Basham, David (5 April 2002). "Got Charts? Wrestling With WWF LPs; Breaking Records With Celine". MTV News. Retrieved 27 September 2013. ↑ ""Falling into you"". Riaa.com. Archived from the original on 17 January 2010. Retrieved 19 March 2010. ↑ Search Certification Database Archived 19 October 2010 at the Wayback Machine CRIA.ca; retrieved 31 December 2009. ↑ "IFPI Platinum Europe Awards" (PDF). IFPI. 2009. Retrieved 7 January 2010. 1 2 "Celine Dion Biography". ARTISTdirect. Retrieved 27 September 2013. ↑ Carwell, Nikea. "Over the Years", Variety, 13 November 2000, pg. 66. vol 380; #13 ISSN 0042-2738. 1 2 "Review- Let's Talk About Love". AllMusic Guide. 2007. Retrieved 7 January 2010. ↑ "Celine Dion, Let's Talk About Love". plugged in.com. Focus on the Family. 2009. Archived from the original on 15 July 2011. Retrieved 7 January 2010. ↑ Sandler, Kevin S.; Studlar, Gaylyn (2009). Titanic: anatomy of a blockbuster (Digitized online by Google Books). Rutgers University Press. ISBN 978-0-8135-2669-0. Retrieved 7 January 2010. ↑ "Let's Talk About Love – Celine Dion". Billboard music charts. 2009. Retrieved 7 January 2010. ↑ "GOLD & PLATINUM certification". Recording Industry Association of America (RIAA). 2009. Archived from the original on 24 May 2012. Retrieved 7 January 2010. ↑ Billboard 26 December 1998–2 January 1999 (Digitized online by Google Books). Billboard music charts. 2009. Retrieved 7 January 2010. ↑ Search Certification Database Archived 1 May 2010 at the Wayback Machine CRIA.ca; retrieved 31 December 2009. ↑ Billboard Magazine. Books.google.com. 2 January 1999. Retrieved 27 September 2014. 1 2 Weatherford, Mike (2004). "Show review: As Dion feels more comfortable, her show improves". Reviewjournal.com. Archived from the original on 12 October 2004. ↑ "That thing: Lauryn Hill sets Grammy record". CNN. 24 February 1999. Retrieved 27 September 2013. ↑ Iley, Chrissy (10 December 2007). "'People are jealous'". theguardian.com. Retrieved 27 September 2013. ↑ "Babs, Pavarotti, Others May Sing With Celine". Rolling Stone. 6 August 1998. Archived from the original on 24 February 2009. Retrieved 29 July 2008. 1 2 Taylor, Chuck. "Epic/550's Dion offers Hits", Billboard, 6 November 1999. pg. 1. ↑ "These Are Special Times Review". AllMusic. Retrieved 27 September 2014. ↑ Lewis, Randy. "Album Review/Pop; Celine Dion Aims to Be the Christmas Star; These Are Special Times, Los Angeles Times (page F-28), October 1998. ↑ "GOLD & PLATINUM". Riaa.org. Archived from the original on 24 May 2012. Retrieved 19 March 2010. ↑ "UK Top 40 Hit Database". Everyhit.co.uk. Retrieved 27 September 2014. 1 2 "Jam! Showbiz". Jam.canoe.com. Retrieved 27 September 2014. ↑ Hung, Steffen. "CÉLINE DION – ALL THE WAY... A DECADE OF SONG (ALBUM)". Australian-charts.com. Retrieved 19 March 2010. ↑ French Albums Chart, LesCharts.com; retrieved 31 December 2009. ↑ Swiss Albums Chart Hit Parade; accessed 27 June 2017. ↑ LES CERTIFICATIONS, disqueenfrance.com; retrieved 31 December 2009. ↑ Macdonald, Patrick (8 October 1998) "The Unsinkable Celine Dion – Pop Diva Is On Top Of The World, And Not Even An Iceberg Could Stop Her Now", Seattle Times; retrieved 22 October 2009. ↑ The Right Honourable Roméo LeBlanc (1998). "Céline Dion, C.C., O.Q". gg.ca. Ottawa: Governor General of Canada. Retrieved 20 March 2011. ↑ LeBlanc, The Right Honourable Roméo (16 May 1998). "Canada Gazette Part I, Vol. 132, No. 20" (PDF). gazette.gc.ca. Ottawa: Governor General of Canada. Canada Gazette. Government House. p. 6 (page 1096 in the Canada Gazette). Archived from the original (PDF ??? -->) on 10 March 2012. Retrieved 20 March 2011. ↑ "Home > Members > Céline Dion: Officer (1998)". ordre-national.gouv.qc.ca (in French). Governor-in-Council. Retrieved 16 February 2012. ↑ "canadaswalkoffame.com". Canada's Walk of Fame. Retrieved 30 October 2006. 1 2 "findarticles.com". The unsinkable Céline Dion — French-Canadian singer — Interview. Archived from the original on 8 April 2005. Retrieved 5 December 2005. ↑ A l'Olympia Celine Dion AllMusic. Retrieved 27 February 2010. ↑ Dollar, Steve. "Review: These Are Special Times", The Atlanta Constitution, pg. C01, 3 November 1998. 1 2 3 "VH1". Céline Dion: Let's Talk About Success: The Singer Explains Her Career High-Points. Archived from the original on 30 March 2005. Retrieved 19 December 2005. ↑ King, Larry. Larry King Live. Personal Interview Interview With Celine Dion. CNN. 26 March 2002. ↑ "BBC News". News.bbc.co.uk. Retrieved 27 September 2014. ↑ "Celine Dion Sues National Enquirer Over Twin Pregnancy Story" Archived 29 December 2008 at the Wayback Machine, courttv.com, 29 February 2000; retrieved 15 May 2007. ↑ CNN. "Celine Dion Gives Birth to Baby Boy". 25 January 2001. Retrieved 15 May 2007. ↑ Pappas, Ben. "Celine fights for her marriage". Us. 22 April 2002. pg 30. ↑ Taylor, Chuck. Céline Dion: God Bless America. Billboard Magazine, 6 October 2001, vol 113, issue 40; pg. 22. ↑ "Celine Dion: My Story, My Dream, Amazon.com; retrieved 14 October 2009. ↑ Peter Nansbridge, with Alison Smith. "Interview with Celine Dion", The National, CBC-TV, 28 March 2002. ↑ "Celine Dion profile Archived 10 May 2009 at the Wayback Machine, columbiarecords.com; retrieved 5 December 2009. ↑ "Celine's 'One Heart' debuts at No. 1" Archived 9 July 2012 at Archive.today; retrieved 5 December 2009. ↑ Dion's CD can crash PCs, BBC.co.uk; retrieved 5 December 2009. ↑ Basham, David. (5 April 2002). Got Charts? Wrestling With WWF LPs; Breaking Records With Celine: A weekly tale of the tape for the statistically obsessed; retrieved 14 October 2009. ↑ "A New Day Has Come". Billboard. 11 April 2002. Retrieved 27 September 2014. ↑ "Rolling Stone". Review—A New Day has come. Retrieved 1 November 2005. ↑ "Entertainment Weekly". EW.com. Retrieved 27 September 2014. ↑ "Slant Magazine". Review—A New Day Has Come. Archived from the original on 6 November 2002. Retrieved 18 July 2006. ↑ "Adult Programming Boosts Pop Vets", yahoo.com; retrieved 14 October 2009. ↑ "Allmusic". Review—One Heart. Retrieved 17 July 2006. ↑ Stein, Jason. "Celine Dion sings flat for Chrysler". Automotive News. 24 November 2003. Volume 78. ↑ Murray, Sonia. Céline Dion's latest takes easy, well-worn route. The Atlanta Journal–Constitution, 25 March 2003, pg. C1. ↑ Kiley, David. (8 June 2003) "Chrysler bets big on Dion's auto endorsement deal", USA Today; retrieved 14 October 2009. 1 2 3 Miracle: A Celebration of New Life. Allmusic.com; retrieved 14 October 2009. ↑ Taylor, Chuck. Céline Dion: "Beautiful Boy". Billboard. New York: 16 October 2004. Vol.116, Iss. 42; pg. 33. ↑ Arnold, Chuck. "Review: Celine Dion, Miracle". People, 22 November 2004. pg, 48. ↑ "Entertainment Weekly". Review: Miracle. Archived from the original on 22 May 2007. Retrieved 30 November 2005. ↑ GOLD & PLATINUM; retrieved 5 December 2009. ↑ "Allmusic". Review—1 Fille & 4 Types. Retrieved 20 November 2005. ↑ Gardner, Elysa. Mariah Carey, 'standing again'. USA Today, 28 November 2002; retrieved 19 August 2005. ↑ "Diamond Award". World Music Awards. 2010. Archived from the original on 27 January 2012. Retrieved 3 February 2012. 1 2 Helligar, Jeremy (31 March 2003). "Céline Dion livin' la vida Vegas!". Us: 56. ↑ Di Nunzio, Miriam (20 March 2009)'A New Day': Vegas gamble pays off for Celine Dion, Chicago Sun-Times; retrieved 14 October 2009. ↑ Gardner, Elysa. (26 March 2003) "Celine Dion's 'New Day' dawns with a TV preview". USA Today; retrieved 14 October 2009. ↑ Ryzik, Melena (17 December 2007) "Celine Dion, she went on and on". The New York Times. Retrieved 14 October 2009. ↑ Hau, Louis (19 September 2007). "The Top-Earning Musicians. Forbes. Retrieved 14 October 2009. ↑ "Dion extends long Las Vegas stint". BBC. 19 September 2004. Retrieved 2 January 2010. ↑ "Billboard.com". U2 Tops Billboard's Money Makers Chart. Retrieved 25 January 2006. ↑ "YouTube". Céline Dion. Archived from the original on 26 July 2013. Retrieved 20 October 2006. ↑ "Céline Dion is leaving Las Vegas". BBC News. Retrieved 5 January 2007. ↑ Review: A New Day; accessed 27 June 2017. ↑ "Celine Dion debuts new single, "Taking Chances"... new Album and Worldwide tour, to come!". Sony Music Entertainment Canada Inc. 12 September 2007. Archived from the original on 4 December 2012. Retrieved 24 September 2012. ↑ "Celine's 'D'elles' Debuted #1 on the Charts and Certified 2X Platinum in Canada!". Celinedion.com. 1 June 2007. Archived from the original on 9 July 2012. Retrieved 1 June 2007. ↑ "'Taking Chances' – Celine's New English Album". Celinedion.com. 24 August 2007. Archived from the original on 12 July 2012. Retrieved 9 May 2007. ↑ Eva Simpson & Caroline Hedley. "3AM: Celine Dion", Daily Mirror, 30 July 2007. pg 17. ↑ Johnson, Kevin C. "Ne-Yo Rides His R&B Vision to the Top", Saint Louis Post-Dispatch. 21 June 2007. pg. 5. ↑ Taylor, Chuck. "Celine Ready To Take 'Chances' On New Album". Billboard. 11 September 2007. Retrieved 13 September 2007. ↑ "Coming attractions: Dion channels cool, fiesty (sic) 'Woman'". USA Today. 13 September 2007. ↑ "Concert Dates". celinedion.com. Retrieved 7 November 2007. ↑ Juno Awards[dead link]. National Post. Retrieved 3 April 2008. ↑ Collins, Leah (3 February 2009) "Nickelback leads Juno nominations Archived 14 September 2011 at the Wayback Machine". Canada.com; retrieved 15 October 2009. ↑ Richer, Jocelyne (2008). "Céline Dion à Québec vendredi le 400e promet un spectacle mémorable". Yahoo! news. Retrieved 7 January 2010. ↑ Céline sur les Plaines: Un moment rempli d'émotions, tvanouvelles.ca, 23 August 2008. ↑ "New Greatest Hits Album: TeamCeline Exclusive Sneak Peek!". Celinedion.com. 26 August 2008. Archived from the original on 7 April 2012. Retrieved 27 August 2008. ↑ (29 May 2009) "Chart Watch Extra: The Top 20 Album Sellers Of The 2000s Archived 15 January 2012 at the Wayback Machine". music.yahoo.com. Retrieved 15 October 2009. 1 2 Dave Matthews Band rocks to the top in concert revenue Archived 12 October 2011 at the Wayback Machine Chicago Tribune. Retrieved 20 December 2009. 1 2 - (3 December 2009) "'Eyes of the World': Part Dion concert film, part family album". usatoday.com; retrieved 4 December 2009. ↑ "Celine: Through the Eyes of the World, an Expanded DVD Edition of the Acclaimed Documentary & Taking Chances World Tour: The Concert, a New Live DVD/CD, Available Tuesday, May 4". Prnewswire.com. 22 March 2010. Retrieved 27 September 2014. ↑ "Celine Dion store". Sonymusicdigital.com. Archived from the original on 8 March 2011. Retrieved 27 September 2014. ↑ Reid, Shaheem (31 January 2010). "Michael Jackson 'Earth Song' Grammy Tribute Focuses On His Love Of The Planet". MTV. Retrieved 29 October 2011. 1 2 "Celine Dion reaches peak of the decade's Ultimate Top 10". Latimesblogs.latimes.com. Retrieved 27 September 2014. 1 2 "Les artistes québécois de la décennie". Le Journal de Québec. Retrieved 27 September 2014. ↑ "Celine Dion Is Americans' Musical Fave". AdWeek. 6 May 2010. Archived from the original on 10 May 2010. Retrieved 16 June 2012. ↑ "Celine Dion is America's Favorite Singer/Musician Followed by U2". newsblaze.com. Retrieved 27 September 2014. ↑ "VOLER Michel Sardou en duo avec Céline Dion". Canoe.com. Archived from the original on 18 January 2012. Retrieved 27 September 2014. ↑ Marc Dupre: un nouvel extrait compose par Celine Dion Archived 13 March 2012 at the Wayback Machine Branchez-vous!. Retrieved 10 October 2010. 1 2 "Celine Dion Confirms Her Return to Vegas Stage". PEOPLE.com. Retrieved 27 September 2014. ↑ "Celine Dion Retrospective – 1996". Oprah.com. 21 February 2011. Retrieved 29 October 2011. ↑ "Celine Dion discusses Las Vegas show, gives away tickets on 'Oprah'". LasVegasSun.com. Retrieved 27 September 2014. ↑ "We Know Céline Dion's Post-Baby Plans (Hint: Think Oscar!)". E! Online. 15 February 2011. Retrieved 27 September 2014. ↑ "Celine on MDA Labor Day Telethon Tonight". Celinedion.com. Archived from the original on 7 April 2012. Retrieved 29 October 2011. ↑ "'Celine: 3 Boys and a New Show' On OWN This Weekend!". Celinedion.com. Archived from the original on 2 October 2011. Retrieved 29 October 2011. ↑ "Who Is Your Dream Celebrity Seat-Mate? | The Official Celine Dion Site". Celinedion.com. Archived from the original on 18 October 2011. Retrieved 29 October 2011. 1 2 "Signature – Celine's New Fragrance, Coming Soon To The Boutique | The Official Celine Dion Site". Celinedion.com. Archived from the original on 4 January 2012. Retrieved 29 October 2011. ↑ "Celine To Appear At Andrea Bocelli's Concert in Central Park | The Official Celine Dion Site". Celinedion.com. Archived from the original on 7 April 2012. Retrieved 29 October 2011. ↑ "VIDEOS: Celine Dion performing LIVE at 2012 Jamaica Jazz and Blues!". Jayblessed.com. Archived from the original on 3 February 2012. Retrieved 9 April 2012. ↑ "The Best of Celine Dion & David Foster" (in Chinese). Five Music. Retrieved 19 October 2012. ↑ "Celine's New Albums". celinedion.com. 7 June 2012. Archived from the original on 3 August 2012. Retrieved 21 September 2012. ↑ ""Sans attendre" – A Big Day For Germany, Switzerland and Belgium". celinedion.com. 2 November 2012. Archived from the original on 4 November 2012. Retrieved 2 November 2012. ↑ "Release Dates For 'Loved Me Back To Life'". celinedion.com. 4 September 2013. Archived from the original on 7 September 2013. Retrieved 4 September 2013. ↑ "Celine Dion: Loved Me Back to Life". celinedion.com. 4 September 2013. Archived from the original on 8 September 2013. Retrieved 4 September 2013. ↑ "Celine Dion Talks 'Loved Me Back to Life' Single, Album (Exclusive)". Billboard. 29 August 2013. Retrieved 29 August 2013. ↑ "Celine Dion Returns to Europe for 7 Exceptional shows". celinedion.com. Archived from the original on 26 April 2013. Retrieved 23 April 2013. ↑ "'Loved Me Back To Life' Certified Gold And A New Single in the UK!". celinedion.com. 2 December 2013. Archived from the original on 3 December 2013. Retrieved 2 December 2013. ↑ ""Incredible" the next single from @celinedion". Twitter. Retrieved 7 November 2013. ↑ "Céline Dion duet with Ne-Yo – Incredible". Vevo. 5 June 2014. Retrieved 5 June 2014. ↑ "Celine Dion releases 'Céline une seule fois / Live 2013' May 19th". celinedion.com. 22 April 2014. Archived from the original on 2 May 2014. Retrieved 22 April 2014. ↑ Lesley Messer (13 August 2014). "Celine Dion Cancels Tour Because of Husband Rene Angelil's Illness". ABC News. Retrieved 13 August 2014. ↑ Joe Lynch (13 August 2014). "Celine Dion Puts Career on Hold 'Indefinitely' to Deal With Husband's Health". Billboard. Retrieved 14 August 2014. ↑ Jennifer Garcia (20 March 2015). "Céline Dion Will Return to Las Vegas Stage". People.com. Retrieved 25 March 2015. ↑ axs.com (14 January 2016). "Celine Dion". axs.com. Retrieved 14 January 2016. ↑ "Celine Dion Begins Work On New French Language Album". idolator.com. 22 October 2015. Retrieved 31 October 2015. ↑ Billboard Staff (4 May 2016). "Celine Dion to Receive ICON Award". Billboard. Retrieved 1 June 2016. ↑ Montreal Gazette (17 July 2016). "Céline Dion's new album out Aug. 26". Montreal Gazette. Retrieved 19 July 2016. ↑ "Lescharts.com – Céline Dion – Encore un soir". Hung Medien. Retrieved 10 August 2017. ↑ "Albums – SNEP". Syndicat National de l'Édition Phonographique. Retrieved 10 August 2017. ↑ "Céline Dion présente un nouvel extrait de son album "Encore un soir"" (in French). frequence-plaisir.com. 13 February 2017. Retrieved 10 August 2017. ↑ "Billboard Boxscore :: Current Scores". Billboard. 19 July 2016. Archived from the original on 22 July 2016. Retrieved 10 August 2017. ↑ "Billboard Boxscore :: Current Scores". Billboard. 6 September 2016. Archived from the original on 8 September 2016. Retrieved 10 August 2017. ↑ "Billboard Boxscore :: Current Scores". Billboard. 5 July 2017. Archived from the original on 5 July 2017. Retrieved 10 August 2017. ↑ "Billboard Boxscore :: Current Scores". Billboard. 26 July 2017. Archived from the original on 25 July 2017. Retrieved 10 August 2017. ↑ "Billboard Boxscore :: Current Scores". Billboard. 8 August 2017. Archived from the original on 8 August 2017. Retrieved 10 August 2017. ↑ Graeme O'Neil (19 December 2016). "The 25 best Songs of 2016". Entertainment Tonight Canada. Retrieved 10 August 2017. ↑ "Celine Dion almost turned down 'Beauty and the Beast' song". Zee News. 4 March 2017. Retrieved 10 August 2017. ↑ "Le Top de la semaine : Top Albums – SNEP". Syndicat National de l'Édition Phonographique. Retrieved 10 August 2017. ↑ Mackenzie Cummings-Grady (3 May 2018). "Celine Dion Debuts Epic New Single & Video 'Ashes' For 'Deadpool 2': Watch". Billboard. Retrieved 3 May 2018. ↑ Gordon Murray (19 July 2018). "Celine Dion Smolders at No. 1 on Dance Club Songs Chart With 'Ashes'". Billboard. Retrieved 26 September 2018. ↑ Eric Frankenberg (7 September 2018). "Celine Dion Wraps Summer Tour With $56 Million in the Bank". Billboard. Retrieved 25 September 2018. ↑ Starr Bowenbank (24 September 2018). "Céline Dion Announces End Of Her Las Vegas Residency After Eight Years". Billboard. Retrieved 26 September 2018. ↑ Josh Glicksman (20 September 2018). "Celine Dion Is Back in the Studio Recording Something 'Great'". Billboard. Retrieved 26 September 2018. ↑ Philip Merrill (27 December 2018). ""Aretha! A Grammy Celebration..." Announced". grammy.com. Retrieved 2 January 2019. ↑ Mikael Wood (14 January 2019). "Review: Was Aretha Franklin properly honored at her all-star Grammy tribute?". Los Angeles Times. Retrieved 14 January 2019. ↑ "Celine Dion Bio". All Music Guide. 2009. Retrieved 7 January 2010. ↑ "Celine Dion Remembers Her Idol, Michael Jackson". Fox News. 30 June 2009. Retrieved 7 January 2010. ↑ "From Beyonce to Gaga: 8 Singers Influenced by Whitney Houston". ABC News. ABC News Internet Ventures. 16 February 2012. Retrieved 20 February 2012. ↑ Celine Dion, Let's Talk About Love Archived 29 August 2008 at the Wayback Machine, pluggedinonline.com; retrieved 13 September 2007. ↑ "Celine Dion". plugged in.com. Focus on the Family. 2009. Archived from the original on 15 July 2011. Retrieved 7 January 2010. ↑ "Celine Dion-- One Heart". plugged in.com. Focus on the Family. 2009. Archived from the original on 15 July 2011. Retrieved 7 January 2010. ↑ "A new Day Has Come". plugged in.com. Focus on the Family. 2009. Archived from the original on 15 July 2011. Retrieved 7 January 2010. 1 2 "The real Céline: Céline Dion's new French album shows her personal side". CBC. 2007. Archived from the original on 31 May 2007. Retrieved 7 January 2010. ↑ Depalma, Anthony (23 February 1997). "Quebec's Little Girl, Conquering the Globe". The New York Times. Retrieved 7 January 2010. ↑ See, e.g., Joel Selvin, "Celine Dion in full force at HP Pavilion", San Francisco Chronicle, 23 February 2009, E2. In this rather hostile review, Selvin wrote: "You want cheese? She is a Velveeta volcano." ↑ "Canadian Broadcasting Corporation". Céline Dion takes swipe at Iraq war; donates $1 m to Katrina victims. Archived from the original on 3 December 2007. Retrieved 14 July 2006. ↑ Glatzer, Jenna (2005). Céline Dion: For Keeps. Andrews McMeel Publishing. ISBN 978-0-7407-5559-0. ↑ "If Ella Fitzgerald is the queen of jazz, Billie Holiday first lady of the blues, and Aretha Franklin the queen of soul, then who is the queen of pop? In the 1990s, it would seem to be a three-way tie between Whitney Houston, Mariah Carey, and Celine Dion. Certainly all three have their devotees and detractors, but their presence has been inescapable." in Lister, Linda (2001). "Divafication: The Deification of Modern Female Pop Stars". Popular Music and Society. 25 (3/4). p. 1. ISSN 0300-7766. ↑ "Cover Magazine". The 100 Outstanding Pop Vocalists. Archived from the original on 16 July 2006. Retrieved 29 August 2006. ↑ "MTV's 22 Greatest Voices in Music". covemagazine.com. Retrieved 15 November 2007. ↑ "22 Greatest Voices in Music". Amiannoying.com. Retrieved 27 September 2014. ↑ Depalma, Anthony (23 February 1997). "POP/JAZZ – Quebec's Little Girl, Conquering the Globe". The New York Times. Quebec Province (Canada). Retrieved 30 June 2010. ↑ "Celine Dion – Live Vocal Range (B2 – Eb6) 3.2 Octaves". youtube.com. Retrieved 3 October 2014. ↑ "Celine Dion's Live Vocal Range: B2-C#6 (3.4 Octaves)". youtube.com. Retrieved 3 October 2014. 1 2 3 "Alain de Repentigny : Céline Dion chante de l'opéra pour Kent Nagano | Musique". Cyberpresse.ca. Retrieved 30 June 2010. ↑ Peckham, Anne (2005). Vocal workouts for the contemporary singer. Boston: Berklee Press. pp. 117. ISBN 0-87639-047-5. 1 2 Holden, Stephen (2 March 1994). "Review/Pop – The International Sound of Celine Dion – Review". The New York Times. Retrieved 30 June 2010. ↑ Hazera, Hélène (21 June 1999). "Dion dans les grandes largeurs : Samedi et dimanche, l'idole canadienne a rempli le Stade de France". Libération. Retrieved 16 March 2011. ↑ "Celine Dion Takes Chances in Latest Album". News.google.com. Retrieved 27 September 2014. ↑ Santella, Jim (19 September 1999). "The Diva Debate Queen Celine". The Buffalo News. Retrieved 5 January 2013. ↑ Miers, Jeff (4 September 2008). "A Long, Strange Trip with Celine". The Buffalo News. Retrieved 5 January 2013. ↑ Hazera, Hélène (20 March 1995). "Céline Dion bio". Libération (in French). Retrieved 17 February 2011. 1 2 Denise Bombardier, L'énigmatique Céline Dion, Albin Michel XO éditions, 2009, page 179. ↑ Lister, Linda. "Divafication: The Deification of Modern Female Pop Stars" (PDF). Linda Lister. Retrieved 25 September 2013. ↑ Harp, Justin (23 February 2012). "American Idol Randy Jackson: "Whitney Houston was voice of generation"". Digital Spy. Retrieved 25 September 2013. ↑ Hiebert, Paul (12 May 2010). "Why Celine Dion Will Always Be Popular — At Least While You're Alive". Flavorwire. Retrieved 25 September 2013. ↑ "Celine Still A Favourite Among American Idol Contestants". The Official Celine Dion Site. 20 May 2013. Archived from the original on 15 June 2013. Retrieved 25 September 2013. ↑ "Billboard Cover: Britney Spears on Why Her Vegas Residency 'Clicked,' Being Inspired by Celine Dion and a New Album Not Being a 'Full Priority'". BIllboard. 13 March 2015. ↑ "ARTISTdirect's Exclusive Interview With Rihanna!". ARTISTdirect. 12 May 2006. Retrieved 25 September 2013. ↑ "Christina Aguilera talks about Celine Dion". YouTube. 26 April 2013. Retrieved 18 April 2014. ↑ "Frank Ocean Gets Up Close in i-D Magazine". Rap-Up.com. 23 March 2012. Retrieved 9 February 2014. ↑ Patterson, Sylvia (27 January 2008). "Mad about the girl". The Observer. Retrieved 9 February 2014. 1 2 "Josh Groban Defends Celine Dion". Groban Archives. 9 August 2007. Archived from the original on 9 April 2014. Retrieved 18 April 2014. ↑ "Jordin Sparks Shares Her Admiration For Mariah Carey, Celine Dion and Christina Aguilera". YouTube. 3 September 2011. Retrieved 18 April 2014. ↑ "Lewis To Meet Pop Idol Celine Dion". Contactmusic.com. 28 October 2007. Retrieved 18 April 2014. ↑ "JessieJ: Celine Dion is a DON! #justsaying". Twitter.com. Retrieved 18 April 2014. ↑ "JoJoistheway: I really have to learn French". Twitter.com. 2 September 2013. Retrieved 18 April 2014. ↑ "Lea Michele & Cory Monteith Get Sinful With Celine Dion!". PerezHilton.com. 27 June 2012. Retrieved 18 April 2014. ↑ "Ariana Grande talking about celine dion". YouTube. Retrieved 18 April 2014. ↑ "Celine Dion – At Seventeen (LIVE in HDTV)". YouTube. 7 December 2008. Retrieved 18 April 2014. ↑ Staff (11 October 2011). "Martina McBride, Target Exclusive Deluxe Edition Of "Eleven" (Photo: Business Wire)". TheStreet. Retrieved 18 April 2014. ↑ "Beyoncé got parenting tip from Celine Dion: 'I use a mommy voice' – Showbiz News". Digital Spy. 17 May 2013. Retrieved 18 April 2014. ↑ "Legendary Santana lets his guitar fly solo". Canada.com. 4 September 2008. Archived from the original on 14 March 2014. Retrieved 18 April 2014. ↑ "Celine Dion & Elton John – H.E.A.R.T. Concert". YouTube. 2 August 2011. Retrieved 18 April 2014. ↑ "OneRepublic – Hey Everyone, tell us your secrets and we'll..." Facebook. Retrieved 18 April 2014. ↑ Staff (10 October 2005). "Martin eyes Coldplay duet with Dion". Irish Examiner. Archived from the original on 22 November 2013. Retrieved 18 April 2014. ↑ "MrsSOsbourne: There is no better female artist". Twitter.com. 10 November 2013. Retrieved 18 April 2014. ↑ "NicoleScherzy: Such an honour to meet". Twitter.com. 10 November 2013. Retrieved 18 April 2014. ↑ "Ne-Yo Teams With Celine Dion for Duet: 'It Definitely Made Me Question My Vocal Ability'". Billboard. Retrieved 18 April 2014. ↑ "Celine Dion – The Reason (The Sessions)". YouTube. Retrieved 18 April 2014. ↑ "YouTube". YouTube. Retrieved 18 April 2014. ↑ "Celine Dion – Making Album Let's Talk About Love". YouTube. 7 December 2011. Retrieved 18 April 2014. 1 2 "Celine Dion – Making Album Let's Talk About Love". YouTube. 7 December 2011. Retrieved 18 April 2014. ↑ "Indiscrétions: Justin Bieber en duo avec Céline Dion pour Believe?" (in French). Nerienlouper.fr. Retrieved 18 April 2014. ↑ "Céline Dion et Jean-Jacques Goldman "S'il suffisait d'aimer" – Archive INA" (in French). YouTube. 9 July 2012. Retrieved 18 April 2014. ↑ "Cher talks about Celine Dion's voice". YouTube. 16 September 2011. Retrieved 18 April 2014. ↑ "Unfinished Songs New CelineDion & Diane Warren Song from the Film Unfinished Song". YouTube. 28 June 2013. Retrieved 18 April 2014. ↑ "Celine Dion – MAKING OF I knew I loved you". YouTube. 6 September 2010. Retrieved 18 April 2014. ↑ "David Foster :Interview Mid 90s Pt2". YouTube. 10 December 2006. Retrieved 18 April 2014. ↑ "J.Lo talking about celine dion on American idol 2011". YouTube. 4 June 2011. Retrieved 18 April 2014. ↑ "Céline Dion". RFI Musique. Archived from the original on 3 January 2007. Retrieved 18 April 2014. ↑ "Celine To Receive the French Legion of Honor Medal". Celinedion.com. 18 May 2008. Archived from the original on 24 December 2013. Retrieved 18 April 2014. ↑ "Céline Dion décorée de la Légion d'honneur par Nicolas Sarkozy". Libération.fr (in French). Retrieved 23 January 2017. ↑ "Celine Dion: The Queen of Las Vegas". Vegasmagazine.com. Retrieved 18 April 2014. ↑ "Britney Spears – Vegas Contract Is TITANIC ... But She Can't Touch Celine". TMZ.com. 16 September 2013. Retrieved 18 April 2014. ↑ Staff. "Why is Las Vegas gambling $15 million on Britney Spears?". Telegraph. Retrieved 18 April 2014. ↑ Goddard, Jacqui (19 March 2011). "Celine Dion promises to bring the sparkle back to Las Vegas". The Daily Telegraph. London, UK. ↑ "CAB Announces 2009 Broadcast Hall Of Fame Inductees". 25 April 1999. Archived from the original on 26 May 2015. Retrieved 25 January 2009. ↑ VH1. The Greatest " Ep. 071 "50 Greatest Women of the Video Era"; 17 May 2003 [archived 29 June 2011; Retrieved 17 March 2011]. ↑ "The 200 Greatest Pop Culture Icons Complete Ranked List" (Press release). VH1. 21–25 July 2003. Retrieved 17 March 2011. ↑ "The Definitive 200". Rock and Roll Hall of Fame. Archived from the original on 9 March 2007. Retrieved 30 August 2014. ↑ Lea Goldman and Kiri Blakeley (18 January 2007). "The 20 Richest Women In Entertainment". Forbes. ↑ "Forbes Top 20 Richest Women In Entertainment". All Women Stalk. Retrieved 27 December 2011. ↑ "Oprah tops celebrity women list". BBC News. 19 January 2007. Retrieved 1 November 2008. ↑ She's Dr. Dion now, courtesy of Laval U, Canada.com; retrieved 7 September 2008. ↑ "Susan Sarandon, Celine Dion named hunger goodwill ambassadors". USATODAY.COM. Retrieved 27 September 2014. ↑ "Céline Dion décorée de la Légion d'honneur par Nicolas Sarkozy". Liberation.fr. Retrieved 5 June 2013. ↑ "Dion receives French Legion of Honour". Canada.com. Archived from the original on 13 October 2013. Retrieved 5 June 2013. ↑ "Order Of Canada Investiture For Celine and René". CelineDion.com. 24 July 2013. Archived from the original on 29 July 2013. Retrieved 25 July 2013. ↑ Guides, Pulse; Green, Patrick (23 January 2017). Night+Day Las Vegas. ASDavis Media Group. ISBN 9780975902288. ↑ Beaunoyer, Jean (1 March 2004). René Angelil: The Making of Céline Dion: The Unauthorized Biography. Dundurn. ISBN 9781459714779. ↑ "Celine Dion to Launch Pure Brilliance Fragrance". WWD. Retrieved 27 September 2014. ↑ Alberts, Sheldon. "A Canadian liftoff; Dion 'flattered' her Air Canada ad chosen as Clinton's campaign song". National Post. 20 June 2007. pg A3. ↑ McLellan, Stephanie Simpson. "Celebrating the Mother–Child Bond". Today's Parent, p. 32. 1 May 2004. ↑ Wray, James (12 January 2005). "Celine Dion to Raise One Million for Tsunami Victims". Monsters & Critics. Archived from the original on 14 May 2008. Retrieved 1 November 2008. ↑ Celine Dion Her letter to China Children & Teenagers' Fund, sina.com.cn; retrieved 15 October 2009. ↑ "Céline contre le SIDA". Gayglobe.us. 9 December 2011. Retrieved 18 April 2014. ↑ Wong, Curtis M. (14 November 2018). "Céline Dion Launches a Gender-Neutral Clothing Line for Kids". Huffington Post. Retrieved 15 November 2018. ↑ Robin Leach. "Celine Dion about to become full-time Nevada resident with sale of mansions?". LasVegasSun.com. Retrieved 5 February 2016. ↑ "Celine Dion : 2000, Céline Dion & René Angélil's remarriage (USA)". CelineDion.US. Retrieved 15 January 2016. ↑ "Celine Gives Birth to Twins!!". Celinedion.com. 25 October 2010. Archived from the original on 17 March 2011. Retrieved 25 October 2010. ↑ Home. "HELLO! – The place for daily celebrity news". hellomagazine.ca. Archived from the original on 12 December 2010. Retrieved 28 February 2011. ↑ "Celine Dion loses husband Rene Angelil to cancer". smh.com.au. 15 January 2016. ↑ "Singer Celine Dion's brother has cancer — Her husband died Thursday". WCVB-TV. Associated Press. 15 January 2016. Retrieved 16 January 2016. ↑ "Céline Dion's brother Daniel, 59, has died". CBC News. 16 January 2016. Retrieved 24 January 2016. ↑ Gonzalez, Sandra (22 March 2018). "Celine Dion cancels Vegas shows due to ear issues". edition.cnn.com. CNN. Retrieved 19 April 2018. Glatzer, Jenna (2005). Céline Dion: For Keeps. Becker & Mayer Ltd. ISBN 978-0-7407-5559-0. Archived from the original on 2016-02-07. "I Believe in You (Je crois en toi)"
"Qui peut vivre sans amour?"